Who knew what when? 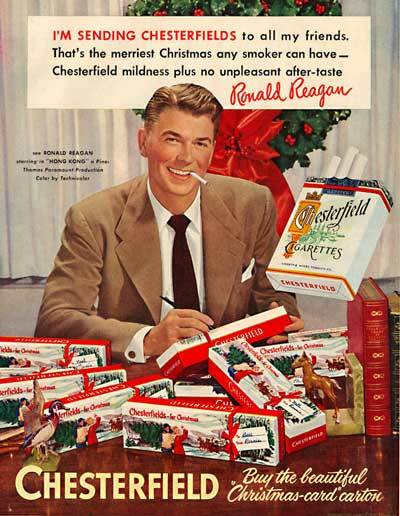 Did Ronald Reagan, 38, know about the evils of cigarettes? Or cigarette marketing? 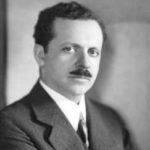 Maybe he wouldn’t have been so eager to send Chesterfields to all his friends for Christmas – no matter how much they paid him – if he had known about Edward Bernays, the Father of Public Relations. Bernays (1891-1995), born in Vienna, was the nephew of Sigmund Freud. One of his first clients when he came to New York City and hung up his shingle was the American Tobacco Company. The task? How to get women to smoke. If he could do that, voila! Cigarette sales might even double! The problem was that women who smoked were considered “loose.” Bernays hired a bevy of young women who were then known as starlets – perfect role models. He sent out a press release telling reporters to come see gorgeous women (this was 1928 – there were few female reporters) “lighting up Freedom Torches.” During the Easter Parade in New York City, a line of stunning women in fabulous gowns – on cue – lit up Lucky Strikes. Bernays single-handedly made women smoking cigarettes elegant and exciting. Fast forward to 1968. Disturbing information was leaking out about just how dangerous cigarette smoking was. American men were the biggest smokers. So if they started quitting…? 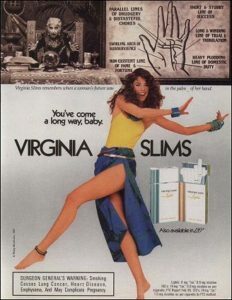 How about a cigarette named Virginia Slims? Nailed it! Later, when it was decided cigarette smoking was bad for American women, too, what to do now? Advertise abroad, especially in Asia. NOTE: Reagan quit smoking in the 1960s when he was governor of California. That is when and why he switched to jelly beans. 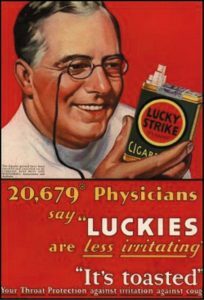 Edward Bernays, at the end of his life, regretted his ad campaigns for cigarettes. I was born in 1949, so this was the article I accessed here. I began smoking 15 years later and have been hooked for life. It can be truly destructive what media advertising can do to people. I am now 66 and have COPD. Thank you for you comment. Yours is a good reminder of the power of advertising and how destructive it can be when used irresponsibly. I am sorry to hear of your COPD and wish you well.